Atten-TION mobile slots soldiers! We’ve received intelligence that Dr Slot’s guerrilla game developers have created an explosive mobile slots adventure – and you definitely won’t want to be MIA for this one. It’s called Full Metal Jackpot, and if you’re made of tough enough stuff, you could be in for some Major wins! It’s a jungle out there, so be ready to do battle across 20 win lines, play for fiery Free Spins and see your wins go Wild! Can you lead your squadron to victory and take home that progressive Full Metal Jackpot? Before you parachute into the jungle and start playing, you’ll need some basic training! Your first drill is to set your total bet. Hit the ‘Bet/Lines’ button in the bottom left corner, then use the ‘+’ and ‘-’ buttons to set your bet-per-line, and the number of win lines you want to play on. These two values are multiplied together to determine your total bet, which will adjust automatically in the ‘Total Bet’ box. For example, bet 10p a line across all 20 win lines and each spin will cost £2. Want to change your tactics? If you made it 50p a line on just 10 win lines, that’s a total bet of £5. You call the shots here, so find a total bet that works for you. When you’re happy, hit the floating arrow to spin the reels. When you’re ready to lock and load, just tap the floating arrow to spin the reels. There’s an army of different symbols in play, and if you line up 3 or more matching ones on an active win line, you win! You know the drill – ‘left, right, left, right’ – well our win lines follow the same rules! They’ll always pay from left to right. When you line up a win, your prize will be displayed on screen before being added to your credit for safe-keeping. Feel like going AWOL for a while? There’s an Auto Spin feature that can keep things rolling for you while you take leave. Click ‘Bet/Lines’ and then the ‘Auto Spin’ button, then select the number of spins you want. You can set Auto Spins to stop if your credit drops below a limit you’ve set here, or if you have a single win that exceeds your pre-set amount. Tap the green arrow button to start, and press ‘Stop’ at any time to take back control. Each time you line up a winning combination, you’ll be rewarded with a multiplier of your original bet-per-line. How big that multiplier is depends on how high-ranking your symbol combo is – press ‘Menu’ and then ‘Paytable’ for a full run-down of how much each symbol combination is worth. Just a few more rules of engagement to brief you on. If you have more than one winning combination on a single win line, only the highest value win will be paid. However, if you win on more than one line in a single spin, we’ll add them all together to make one big win! In wartime, you always need allies you can count on, and our Wild symbol is definitely one of them! That’s because he can stand in for almost any other symbol to turn a defeat into a victory! Let’s say you’ve lined up two K symbols on an active win line – not enough for a win, right? Well, not if your good pal, the Wild symbol, is lined up alongside them! He’ll act as a third K symbol, giving you a win worth three Ks! He’s got your back, but he can’t help you win the progressive Full Metal Jackpot. The only way to do that is with FIVE Jackpot symbols on an active win line. He also can’t stand in for the Free Spins Sergeant symbol, but he CAN help improve your chances of winning in Free Spins mode. Find out how in the Free Spins section below. Your short-tempered Sergeant can really get fired up sometimes, but when he goes on one of his rants, it’s actually good news for you. 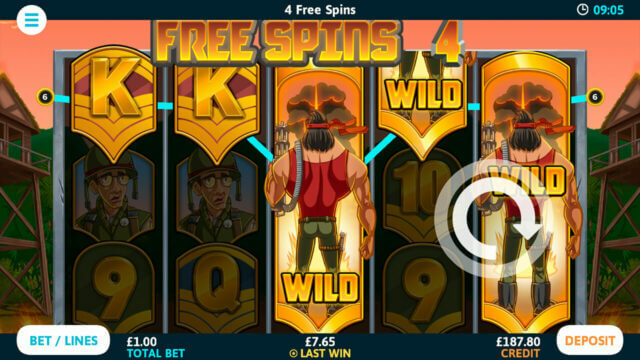 If you see three or more of his angry face scattered anywhere on the reels, you’ll win some free spins! Spin in 3, 4, or 5 Free Spins symbols and get 5, 10, or 15 free spins respectively. You’ll definitely know when your free spins have started, because his tirade will set the whole base alight! While Sarge is shouting, your bet-per-line and number of win lines will lock to the values of your last paid-for spin, so you won’t be able to change them until the flames die down. When you’re in Free Spins mode, something special happens to Wild symbols too! They become banner Wilds, so they can take up two or even all three spaces on one reel, making wins even more likely. If you love free spins, you’ll want to take advantage of Dr Slot’s welcome offer for new players. Make an account today and you could get up to 120 no deposit free spins and up to £1000 in deposit match bonuses! * You wouldn’t go into battle without reading your briefing first, so make sure you’re aware of the terms and conditions before you deposit, soldier! Full Metal Jackpot has a theoretical return to player of 94.6%. This is based on long term playback.